I gotta say, this is one of the coolest vignettes, I’ve seen in a long time. Rescued from an 1893 gardening catalog, this vintage fruit heading graphic with space for text could be used in so many ways. First off, it’s absolutely huge! The full-sized version, when printed, covers almost half a standard sheet of paper. And, secondly, there are so many wonderful elements within it. Thirdly, there’s a piece of paper in the middle of the graphic just waiting for your customized text. The drawing is chock full of luscious fruits. Makes sense. The catalog was for River Raisin Valley Nursery who sold primarily fruit trees and berry plants. There’s strawberries, blackberries, quince, grapes, apples, peaches, plums, pears and cherries. Might even be a few more fruit drawings that I missed. Along with all of the beautiful fruit, the leaves of each plant are also included. 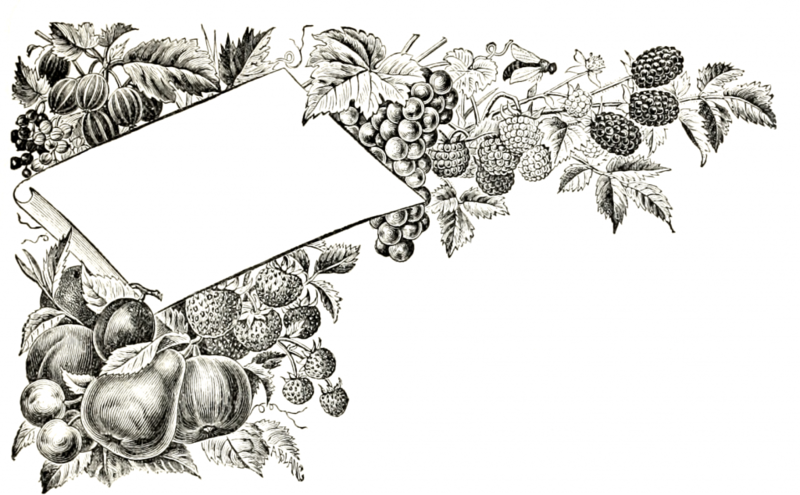 With some color, I suspect this vintage fruit heading graphic could be even more stunning. Click on the image shown above to retrieve the full-sized, cleaner version of this vintage fruit heading graphic with room for your own text.